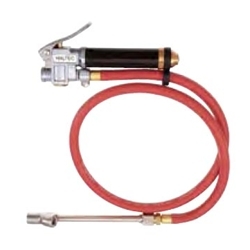 Inflating Gauge with Lock-on Air Chuck 3' Hose Haltec I-405-3LOM / BOWES HT I-405-3LOM. Meets OSHA Requirements. Inflation unit with in-line gauge. Lightweight aluminum body with brass calibration bar and O-rings seals. Calibrated 10-120 psi in 2 lb. increments - precise inflation control - 1/4" female NPT inlet with CH-360-OP clip-on air chuck. Also available with hose lengths of 3’ or 9’. Specify length when ordering.